After an interminable winter of rain and grey skies – cold but rarely freezing – we can see the light at the end of the tunnel. 10 days ago, the first huge magnolia flowers started to open quickly followed by others all around the garden. These are massive trees with pale pink, white or darker, shocking pink flowers on bare branches standing out against the sky and the bareness of all the other trees. 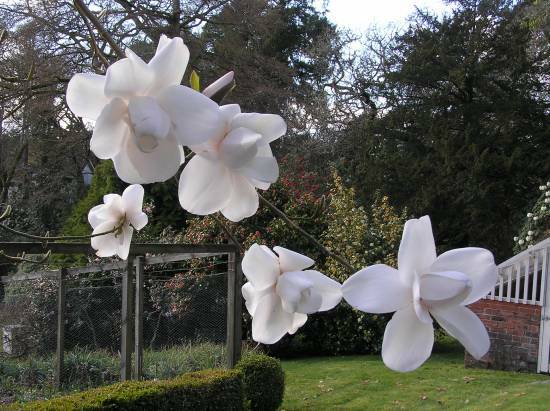 It’s still grey and light levels are only just starting to lift but the magnolias love it – just like the Himalayas! You can see them at Glenarn in Rhu and also at Crarae, Aduaine and Benmore. At Glenarn we start the season at the end of March with more flower than most gardens. 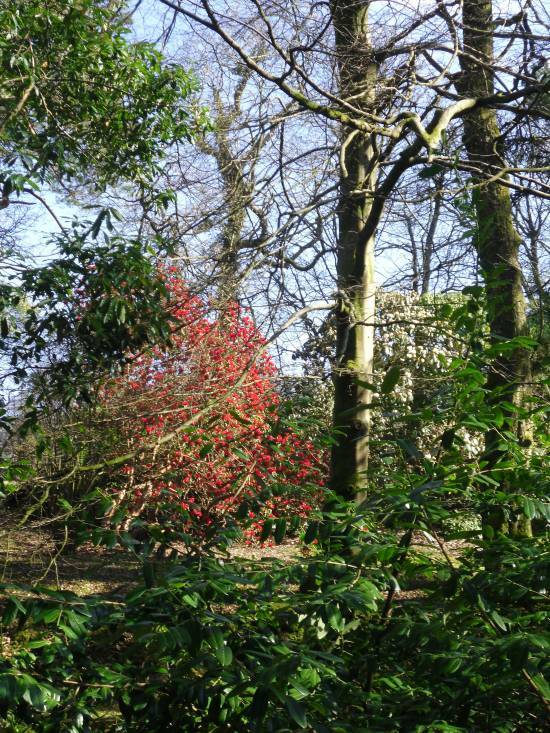 This is because the Gibsons who gardened here from 1927 to 1982 hybridised many of the large-leaved species such as Rhododendron sinogrande, R, macabeanum and R. eximium, to create a flush of flowers, which last through April and into May. These big boys are now full grown trees, 30 to 40 feet high and covered in huge trusses of flower this year 2014 (they can’t do it every year as it exhausts them!). Mike and I have had fun identifying the crosses, from the leaves, bark. habit and flowers – and matching this to the garden records so visitors can now read our labels. As April rolls on, every day there is more to see. 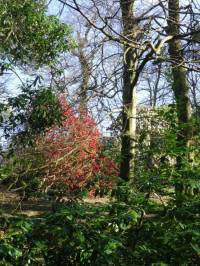 This week we have seen the scarlet Rhododendron shilsonii open up, acid yellow R. luteiflorum for once not frosted and the first shocking pink flowers on the old Victorian hybrids round the lawn. Rhododendron fulvum is just showing soft pink against the dark foliage with amazing rufus indumentum (the furry backs to the leaves). In the rock garden, little treasures are re-appearing. The sparkling white heads of Sanguinaria canadensis burst through over night as do the trillium leaves and flowers. Erythroniums open among the first primulas, to show their lily parentage in miniature, this year not cropped by the roe deer because of the new fence! And the paeonias push their way up, pink and striking against the mulched earth – you can see the buds of Paeonia mlokosewitschii, in embryo, developing as you watch each day. They won’t flower for another month but offer the expectation of more to come. All the Glorious Gardens of Argyll and Bute are now open to visitors and we welcome you to come and see how varied and different they all are.